COLUMBUS, GA (WTVM) - You may think the Police Academy is tough and intense. We've all seen the movies and TV shows: cops speeding through the city in luxury cars, shooting at the bad guys while stuff blows up all over the place. "These dramatizations that's Hollywood-type, that's not the real world," said Billy Mixon, director of the Georgia Public Safety Training Center in Columbus. "This class, we've had a student who withdrew because it's just not what he thought it would be." Mixon says today's police academy is a three-month long, 408 hour course that tests the mind and body of the 24 aspiring officers from all over the state. The day begins at 6:30 a.m. It consists of physical training, testing, inspections, class work, and more testing. "For the most part it's fun, it's very similar to a college atmosphere, but a little bit more stressful," Cadet Alexis Rittenhouse said. Rittenhouse plans to join the force in Dalton, and she says the last few weeks have been intense. "Opened up with criminal law, so any kind of criminal law you could think of your forgeries, batteries," Rittenhouse said. "The second week dealt with criminal procedures so we really got to learn about the Fourth Amendment. The third week, we covered about six or seven topics between piece officer liability to you name it." "What people don't realize is all of the academic, all of the mental challenges that the students have to go through as well as the physical training." And it does get physical. In one exercise cadets are learning how to use cover in an active shooter situation. An instructor fires off a paintball gun in their direction, hitting them some multiple times. "Even though they are just paintballs, I try to treat every situation like it's the real thing. of course I didn't want to get hit. But, when I did get that positive feedback from when I wasn't using my cover properly, I just tried to apply it an move forward from it." Joedave Roberson, 25, is training to join the Columbus Police Department. "It's always been a childhood dream of mine so, I'm just making that a reality," Roberson said. Roberson says although the training is tough, it's necessary. "Thinking about the job and what it entails, having the power to take someone's freedom away, you want to know officers are properly trained and they are making the right decisions," Roberson said. After their bruises healed, we followed the group to Forsyth for the emergency vehicle operator course. The course is designed to teach new officers emergency response driving. The cadets will learn skid recovery, braking, and precision driving. These are only a few of the many lessons cadets will learn while in the police academy. Mixon says is not an easy task to take on but the reward of being an officer, camaraderie and helping the community are worth it..
Cadets must pass written and simulation tests to be eligible for graduation. Graduation is scheduled for Dec. 5. 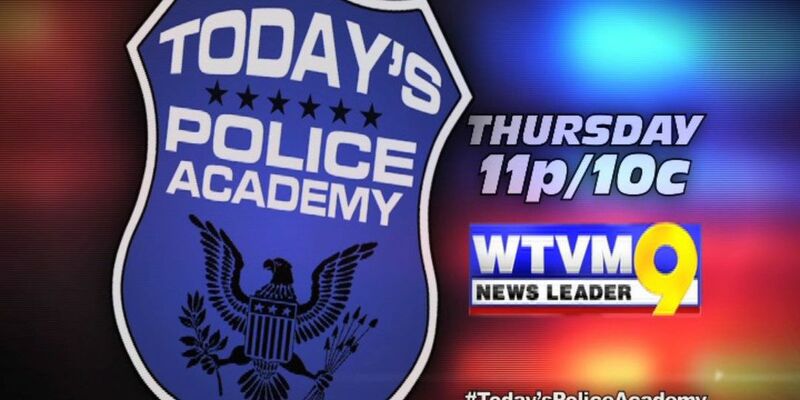 Join in the conversation on social media by using #Today'sPoliceAcademy.